Apsarakonda Falls near Honnavar in Karnataka is a seasonal waterfall. 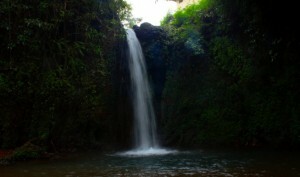 The scenic waterfall can be reached by a light trek. The waterfall stands in the vicinity of a pristine beach, a hill, some ancient caves and a few temples.